A resistance widow. A silent co-conspirator. The only one who survived. The Third Reich has crumbled. The Russians are coming. Can Marianne von Lingenfels and the women in her care survive and build their ravaged world anew? 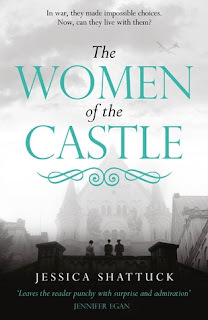 Marianne - widow of a resistor to the Nazi regime - returns to the grand, crumbling castle where she once played host to all of German high society. She assembles a makeshift family from the ruins of her husband's movement, rescuing her dearest friend's widow, Benita, from sexual slavery to the Russian army, and Ania from a work camp for political prisoners. She is certain their shared past will bind them together. This is an astonishingly powerful story that follows 3 women - Benita, Marianne and Ania - and how their lives are affected before, during and after the 2nd World War in Germany. All of the women face their own personal battles and the author captures brilliantly the position that they are put in, as those around them disappear and new ways of life are forced upon them. This book captures the strength of these women through the most troubling times as they fight to maintain a certain sense of normality for the children. Some of the most powerful times come after the war as they start to learn more of what their families were involved in and how their actions were justified - it is always amazing to see how people adapt to their surroundings and for these women their lives changed so much. Before the war we hear of how life was in Germany and how many saw the actions of Hitler as only doing the best for his country, until they started to hear the rumours of how he was treating the Jewish people of the community. During the war, the book tells of how the women were forced to live, what was expected of them and how they helped others who had travelled many miles to escape the worst. And then after the war, this book looks at how the women and the communities came together to rebuild, but the ghosts from the past and choices that they made during the war are still there to haunt them. For me this book lacked the emotional impact that a book like The Nightingale (by Kristin Hannah) had on me as a reader, but it was still so well written and an important and absorbing story set around one of the most horrific times in history. Highly recommended. Thank you to Readers First for my advanced copy in return for a fair and honest review.